The FM100 Hue Test is an easy-to-administer test and a highly effective method for measuring an individual's color vision. 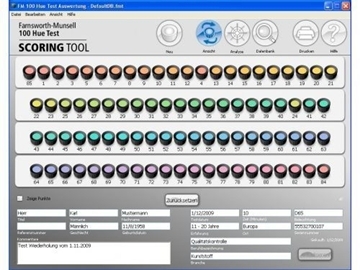 Used by industry for over 40 years, the test is used to evaluate and rank color acuity. 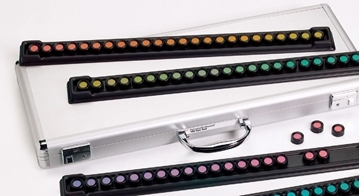 This portable, 15-minute test analyzes how accurately you see color. The easy-to-use scoring software indicates where you have a color vision deficiency such as color blindness. An abridged version of the 100 hue test for screening color vision defects only. Intended for the detection of color vision defects such as red-green and blue-yellow deficiencies as opposed to color acuity. The test consists of a reference cap and 15 removable chips of incremental hue variation. Instruction and score sheet included.